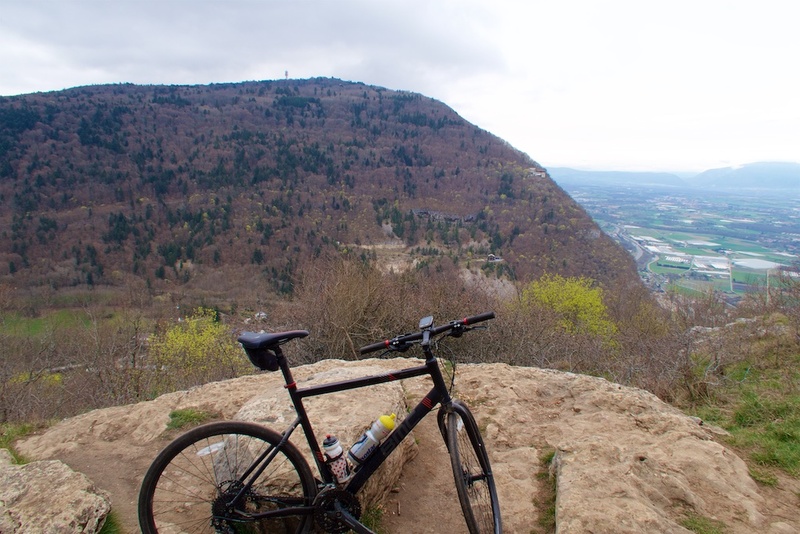 Mont Salève is a wonderful mountain for cycling. In Haute Savoie, France, it over-looks Geneva, Switzerland – it’s my “home mountain.” The cool part of this massif: one can ride several kilometres along the top, providing views of Mont Blanc and the Alps in one direction and Lac Léman (Lake Geneva) and the Jura mountains in the other. 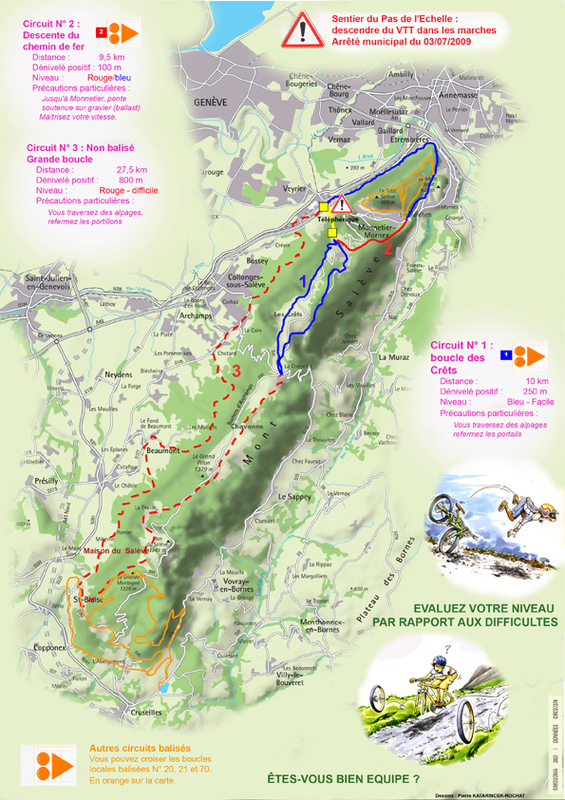 A few years ago I detailed the five road bike routes up Mont Salève – see here. 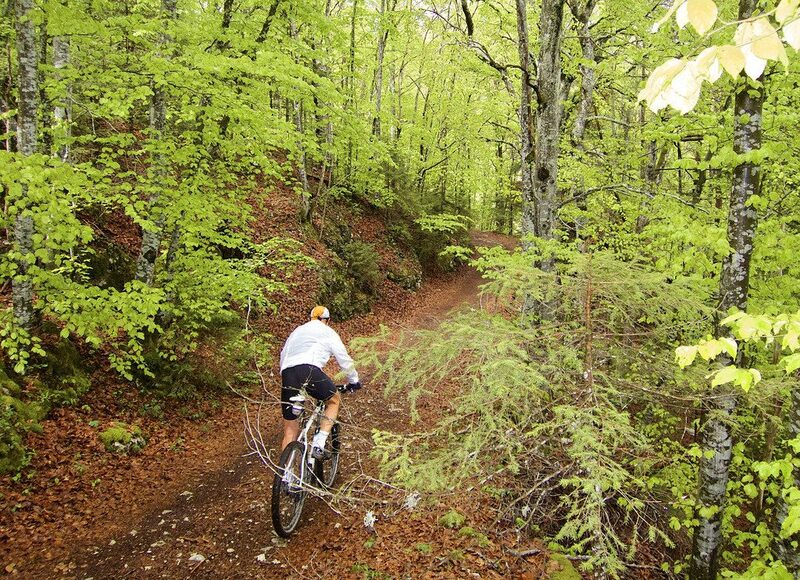 But there are also all sorts of mountain bike options. I’ll map and describe several below. If I’ve missed anything interesting feel free to let me know in the comments. To begin: there are three signed mountain bike routes that can be linked to make a huge loop, roughly 50 kilometres (see video at bottom). Warning! These are not perfectly signed routes. You will almost certainly get lost without help. So below I’ll provide a link to gpx file and detailed map for all three. The blue route on the map. 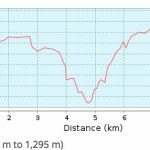 9.5 kms, 290 metres ascent.. GPX/Map. This loop starts and finishes at Col de la Croisette passing the Cable Car/Télépherique station roughly half way through the loop. It’s entirely up high, always above 1000 metres of altitude. Note, this route partly overlaps with the orange route – examine the map closely. The red route on the map. 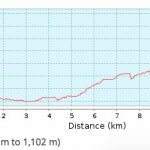 12 kms, 775 metres ascent.. GPX/Map. This segment starts at the base of the mountain near the bottom of the cable car and climbs to the top station at 1097 metres. It is almost entirely on wooded trails. Lower down, it takes a great forest track beside the auto-route to cleverly avoid all traffic. Much of the climb follows the ancient funicular/railroad line that climbed the mountain from the 1890’s until the 1930’s. Warning though, the top half is extremely steep with two kilometres average +20% – much of it too steep and slippery for me to pedal. You could avoid this stretch by taking the paved road between Monnetier and the Téléphérique. The orange route on the map. 31 kms, 860 metres ascent, 1500 metres descent. GPX/Map. 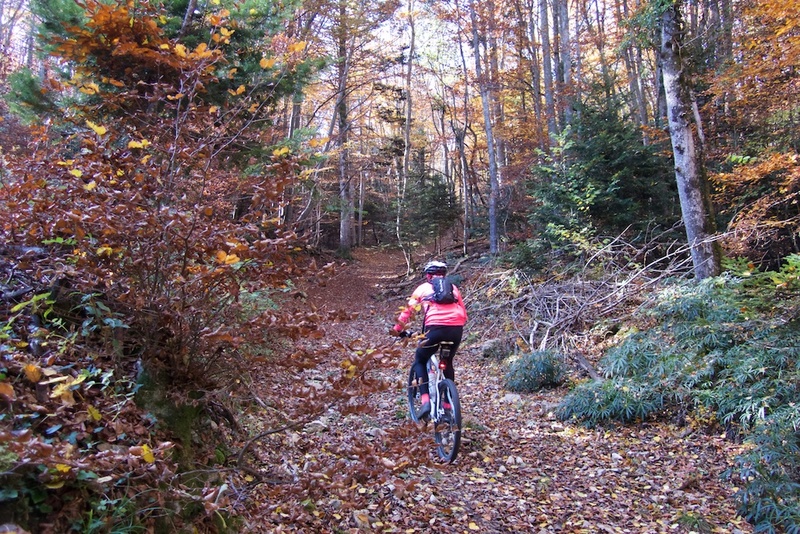 This incredible trail begins at Col de la Croisette initially riding along the top of the south section of the mountain. Very fun. From La Thuile the road next takes a fairly crazy trail down to St. Blaise. Personally, I prefer a detour to this steep descent. The pink track on the map provides a superb, far more ride-able alternative, primarily on trails (it’s the top photo of this article). But either option works well. 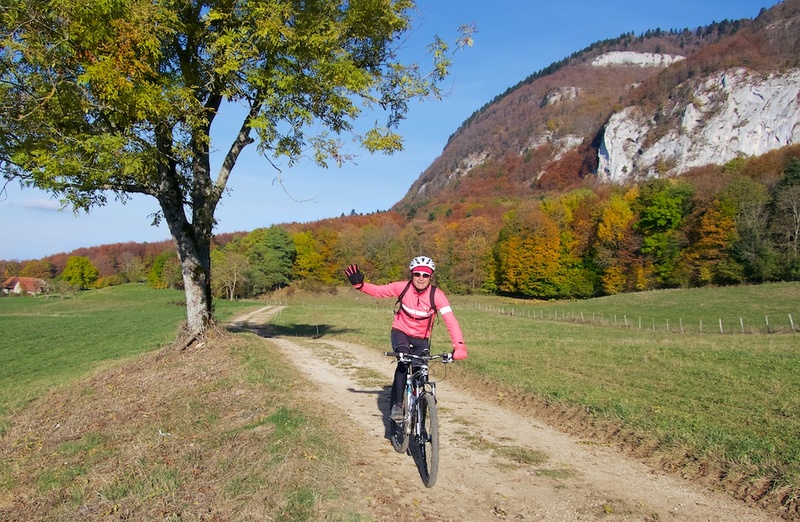 Lower down, past St. Blaise, is a fantastic stretch on farm roads that eventually pass through the old Chartreuse de Pomier monastery grounds. 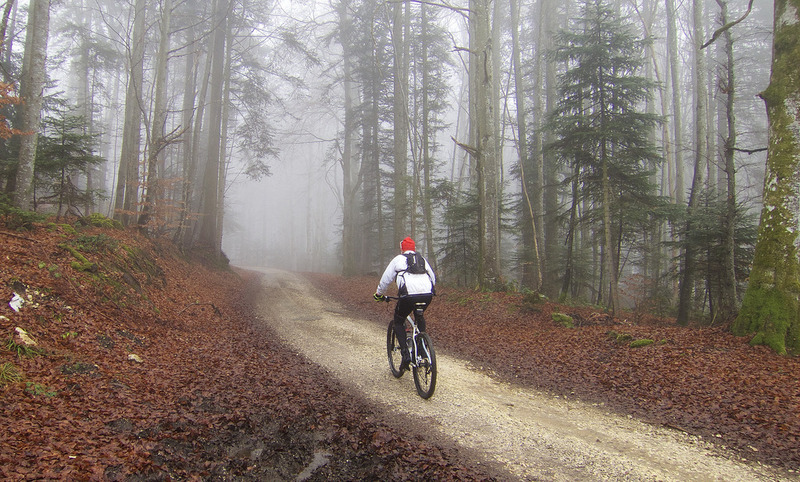 It’s part of the Chemin de St. Jacques de Compostelle trail – be considerate to hikers. We’re near my home, I ride this section happily all the time. Past Beaumont, the trail then goes up into the woods on sometimes tricky wooded trails in an attempt to avoid traffic. This is the toughest technical section of any of the three routes. But it’s deserted, and worth the effort. The brown route on the map. 16.5 kms, 570 metres ascent/descent. GPX/Map. 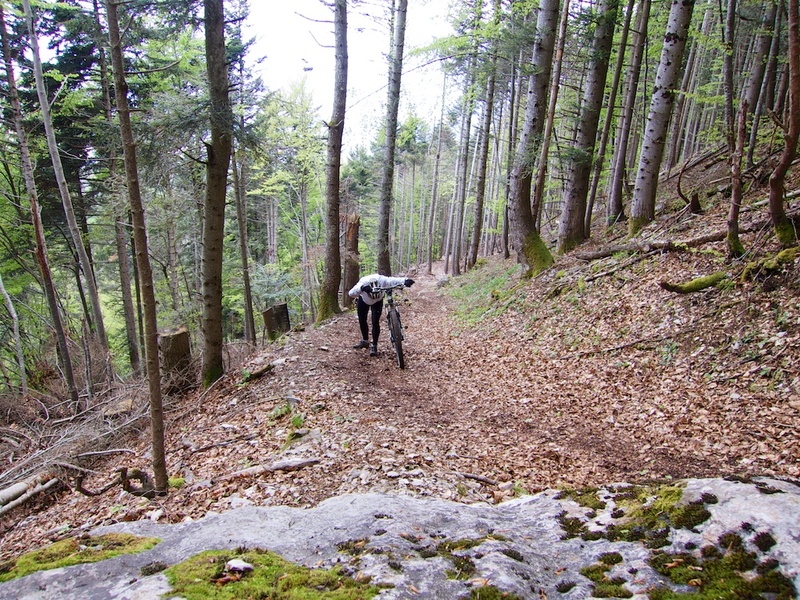 The south edge of Mont Salève is full of trails. This loop hits many of them. All wooded and peaceful. The purple route on the map. 10.7 kms, 530/429 metres ascent/descent. GPX/Map. Le Petit Salève is the smaller massif on the north side. Plenty of bumpy trails. The high point is 899 metres at Camp des Allobroges – names after an iron-age Celtic tribe settlement/fort here. How cool is that? The green route on the map. 7 kms, 640 metres ascent. GPX/Map. This little-known route is an old farm road. Occasionally very steep, with a short stretch of bike carrying. But a lot of fun. It joins the paved road near 1300 metres. From there one could join Signed Route #3. I’m fortunate to live on the edge of this great mountain. From a cycling perspective, it’s incredible how many route options there are …. for both road and mountain bikes. Hopefully, this post gives a few people an idea or two to explore. Here’s a 3d video of a route that does much of all three signed routes. The photos are slightly unsynched and we’re all taken atop the mountain. What was the railway for there Will? I did not know it existed?